Just three days before Takeover: Brooklyn II, NXT was all about the build for that show, however there was still a Six Woman Tag Team bout and Hideo Itami in action, but was it any good? The main event this week was a six woman tag team bout used to introduce three new characters to the roster as Smackdown Live's Carmella teamed with Liv Morgan and Nikki Glenncross [Nikki Storm] to defeat another Smackdown Live superstar Alexa Bliss and Tough Enough alumni Mandy Rose and Daria Berenato. Considering the relative inexperience of a number of the competitors, this was a much more enjoyable contest than I was expecting with all six women handling themselves well and putting a decent six person tag. All three of the new comers showed what they had to offer with ICW's Glenncross clearly the most accomplished newbie in the ring, but Berenato and Rose both have something different to offer what is becoming a diverse women's division again in NXT. A unique way to bleed new faces into the roster, whilst surrounding them with popular performers like Carmella and Bliss. 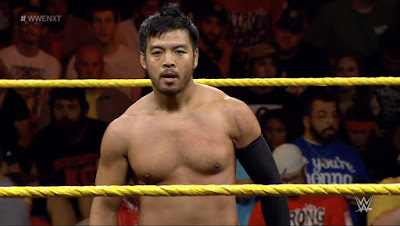 Hideo Itami continued his re-build with a victory over another Cruiserweight Classic alumni in the form of Mustafa Ali. Brief as it was, I was impressed by Ali once again as he added extra pieces to his performance that most enhancement talent wouldn't usually do, bringing some character development with a cocky opening section. He also pulled out some nifty moves like a through the ropes forward roll neckbreaker situation that got my attention. The crowd continues to warm back up towards Itami and his final flurry of offence, finishing with the Busaiku Knee will go a good way to earn back that approval. Itami has clearly been eased back into television, hopefully following Takeover: Brooklyn II we'll get to see him opposite some bigger names in NXT and get given a proper storyline to get involved in. The show concluded with a sick interview by Byron Saxton involving NXT Champion Samoa Joe and #1 Contender Shinsuke Nakamura in where it felt like there was legitimate tension between the two. The Women's Title match from Takeover: Brooklyn II recieved it's own promo package, which managed to convey the story of contest very well. Two decent matches this week, that both did their jobs well, either re-building up recently injured talents or introducing a number of new faces at the same time. Of course, the majority of the show was used to build for the supercard and when you only have one hour a week, that's definitely the best way to go about. It was cool to see a number of matches for the show promoted at the same time and if the peak of the show with Samoa Joe and Shinsuke Nakamura didn't have you convinced that Takeover: Brooklyn II was a must-see show, then nothing will.